Salem Valley Veterinary Clinic provides optimal care for your pet during all stages of its life. From puppy and kitten hood to geriatric care, our team is there for you. Wellness exams can help identify health conditions before they become serious and help prevent future illness. In addition to annual wellness exams and vaccinations, we offer a range of services including dentistry, senior health screening, and routine surgical care. 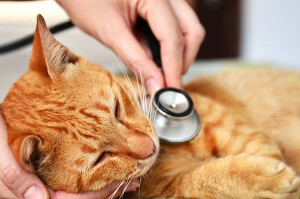 Our veterinarians make their annual wellness care recommendations based on the guidelines established by the American Veterinary Medical Association (AVMA) and American Animal Hospital Associations (AAHA). We then customize our recommendations based on your pet's age, medical history, lifestyle and hereditary factors. We develop a vaccination program based upon your pet's lifestyle. We develop a plan for the specific needs of your pet and your own particular environmental situation. We will review with you the best ways to control fleas, ticks, and intestinal parasites in your house, yard, and on the pet. We maintain an inventory of pharmaceuticals, flea and tick control products, heartworm preventatives, prescription diets, and more to meet the needs of your pets. Home delivery is also available through our partner pharmacy Vet's First Choice. We offer microchip implantation as a means of permanent identification. Once your pet's microchip is in place, the microchip ID code along with your contact information will be registered in the HomeAgain national pet recovery database. Additional information is available by visiting HomeAgain. We provide guidance regarding your pet's nutritional needs for each life stage, including dietary requirements for growth, weight maintenance, performance, and special needs. If necessary, consultations with university hospital nutrition services are available. There may be times where your pet requires more specialized attention. We work closely with area specialists who can provide this care, and work to make this transition as seamless as possible. We act as your pet's primary veterinarian, ensuring that we are involved in their referred treatment and informed of all their needs.